Some of this month's most explosive moves are coming from large-cap stocks. Here's how to profit from five of them. Who says big stocks have to be boring? This week brought some good examples of big price moves in some of Wall Street's biggest stocks. Tech behemoth Apple (AAPL - Get Report) rallied more than 7% yesterday. $41 billion streaming video company Netflix (NFLX - Get Report) has clawed its way 7% higher since Monday. And $25 billion bank State Street (STT - Get Report) shot 8% higher during Wednesday's session. Simply put, some of this month's most explosive moves are coming from large-cap stocks. And we haven't seen the last of that trend -- not by a long shot. As I write some of the biggest stocks on the market are setting up big breakout moves. To find the big stocks that make sense to buy this summer, we're turning to the charts for a technical look at five large-cap names that are on the verge of breakout territory. Leading off the list is $259 billion telco AT&T (T - Get Report) . AT&T has been a stellar performer in 2016, up more than 24% since the calendar flipped to January -- but this stock could still have further to run thanks to a classic continuation pattern that's been forming in shares for the entire month of July. Here's how to trade it. AT&T is currently forming an ascending triangle pattern, a bullish continuation setup that's formed by horizontal resistance up above shares at $43 and uptrending support to the downside. Basically, as AT&T's stock price pinballs in between those two technically important price levels, this stock has been getting squeezed closer and closer to a breakout through our $43 price ceiling. When that happens, we've got our buy signal. Relative strength, which measures AT&T's performance vs. the rest of the broad market, adds some extra confidence to the stock price action. Our relative strength line, down at the bottom of the AT&T chart, has been holding onto its uptrend since January, which tells us that this stock is still beating the averages on a long-term basis right now. 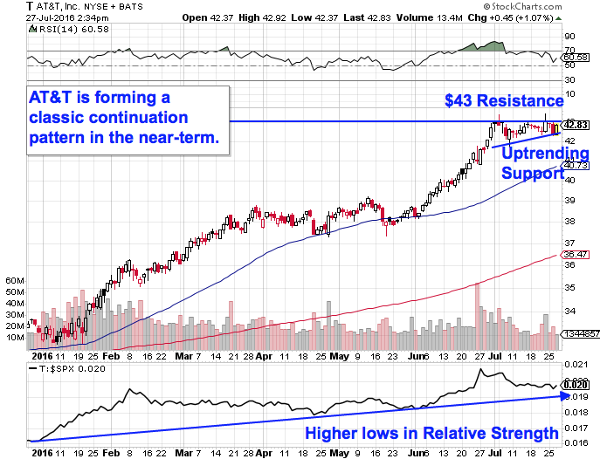 When AT&T breaks out above $43, consider it buyable. We've got the same setup happening in shares of $65 billion consumer products company Colgate-Palmolive (CL - Get Report) -- the difference is that the breakout in Colgate happened almost a month ago. Like AT&T, Colgate-Palmolive has been forming an ascending triangle pattern, in this case with resistance up at $72.50. That price ceiling got taken out when the calendar flipped to July. Immediately after breaking out, Colgate pushed up to $75 before reversing course with a "throwback." 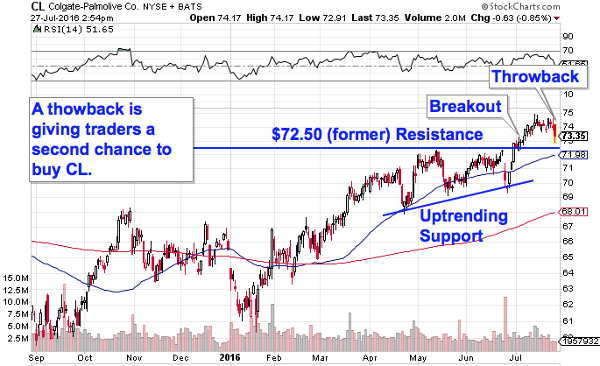 A throwback happens when a stock breaks out and then moves back down to test newfound support at that former price ceiling level -- in this case, our $72.50 price level. And while throwbacks look ominous, they're actually constructive for stock prices because they reverify the stock's ability to catch a bid at support. For that reason, it's best to think of a throwback as a buying opportunity in Colgate-Palmolive, not a red flag. From a risk/reward standpoint, the next bounce off of $72.50 is a buying opportunity. The 50-day moving average has been a halfway decent proxy for support in Colgate-Palmolive for the last several months. That makes it a logical place to park a protective stop if you decide to buy the bounce here. Things have looked a lot less auspicious for shares of America Movil (AMX - Get Report) . Since January, this $39 billion Latin American wireless carrier has seen its share price retrace by 14%. That's the bad news. The good news is that long-suffering shareholders could finally be in store for a reprieve -- America Movil is finally beginning to look "bottomy" this summer. America Movil is currently forming a double bottom, a bullish reversal pattern that looks just like it sounds. The double bottom in AMX indicates a gradual shift in control of shares from sellers back to buyers; it triggers a buy signal with a push back up through the resistance level that's acted like a price ceiling for shares. That breakout level comes in at $13 for AMX. 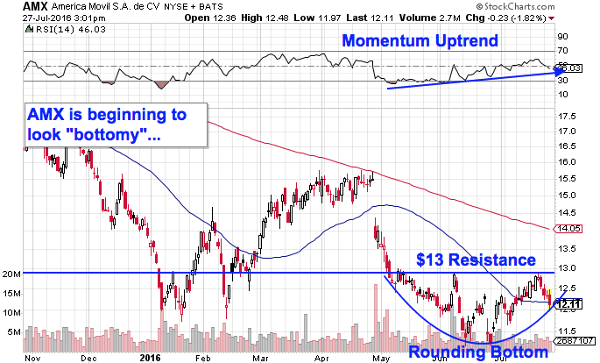 Price momentum adds some extra confidence to the reversal setup in America Movil. While this stock has been carving out its bottom, AMX's momentum gauge, 14-day RSI, has been making a series of higher lows that point to growing buying pressure since May. Once shares are able to clear resistance at $13, it's time to join the buyers on America Movil. It doesn't take a whole lot of trading expertise to figure out what's happening with the chart of Royal Dutch Shell (RDS.A - Get Report) , (RDS.B - Get Report) . This $225 billion oil and gas supermajor has been making its way up and to the right all year long, up more than 23% since the start of 2016. And as we head into the summer months, Shell is still a "buy-the-dips stock." 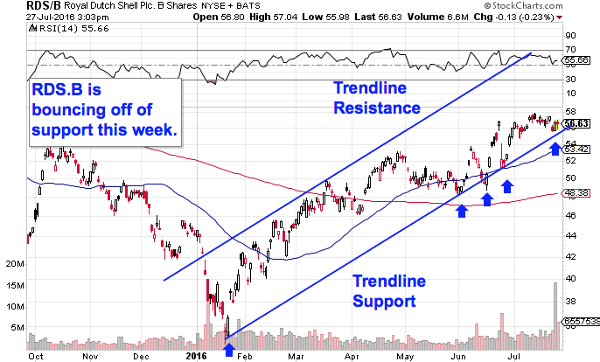 All year long, Shell's price action has been stuck in a well-defined uptrending channel. That channel is formed by a pair of parallel trendlines that have contained the vast majority of this stock's price action all the way back to January's lows. So far, every test of the bottom of Shell's price channel has provided investors with a low-risk, high-reward opportunity to build a position in this stock. And shares are bouncing off of support for a fifth time this week. Actually waiting for this latest bounce is important for two key reasons: It's the spot where shares have the most room to move up before they hit resistance, and it's the spot where the risk is the least (because shares have the least room to move lower before the channel breaks, invalidating the upside trade). Remember, all trend lines do eventually break, but by actually waiting for a bounce to happen first, you're ensuring Shell can actually still catch a bid along that line before you put your money on shares. It's been a challenging year so far for shareholders in $100 billion biopharmaceutical company Gilead Sciences (GILD - Get Report) . Year-to-date, this big drug maker has given back almost 20% of its market value, trailing the S&P by a big, ugly margin. But after a rough first half to the year, it might finally be time to start buying shares of Gilead again -- here's why. 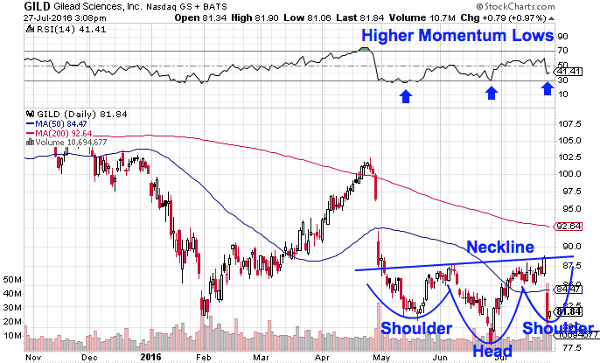 Gilead Sciences is currently forming an inverse head and shoulders pattern, a bullish reversal setup that indicates exhaustion among sellers. You can spot the pattern by looking for two swing lows that bottom out around the same level (the shoulders), separated by a bigger trough called the head; the buy signal comes on the breakout above the pattern's "neckline." For Gilead Sciences, that's up at the $88 price level. Gilead is another stock where momentum adds some evidence for an upside move -- this stock's momentum gauge, 14-day RSI, has been making a series of higher lows at the same time its share price was forming the reversal setup. That's our indication that buyers are building strength here at lower levels. Once shares are able to catch a bid above $88, we've got our signal that the buyers are back in control.